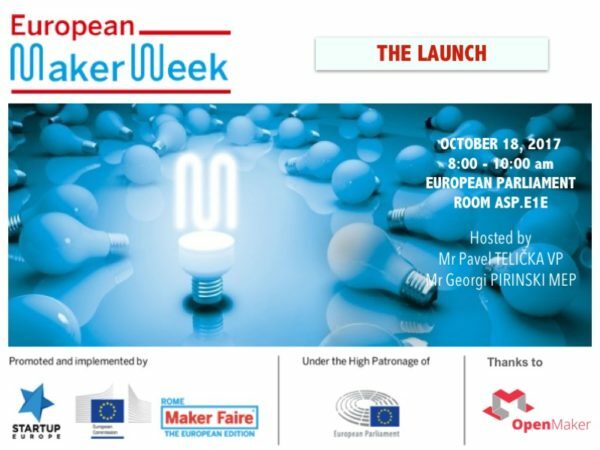 On October 18th, OpenMaker launched of the European Maker Week 2017. 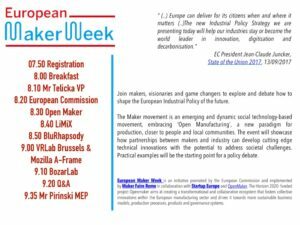 European Maker Week is an initiative is promoted by the European Commission and implemented by Maker Faire Rome, in collaboration with Startup Europe. 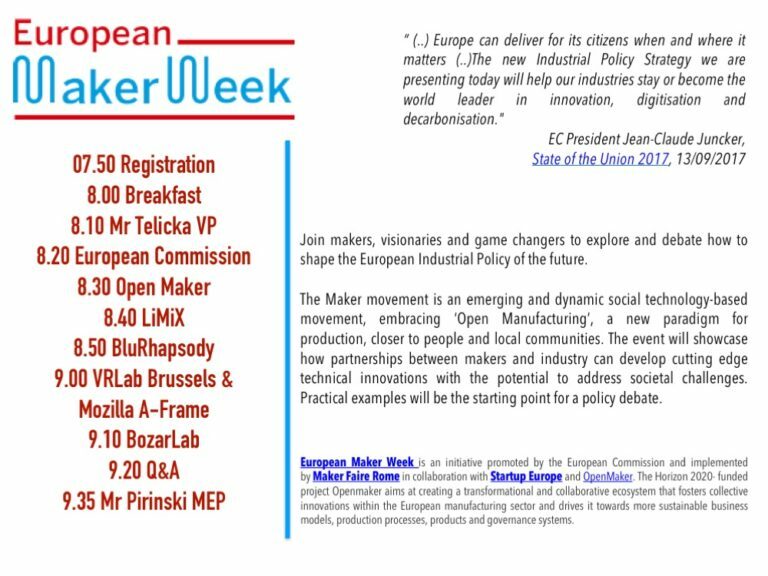 The aim of the European Maker week is twofold: to create awareness about the importance of the maker culture and to build bridges between local authorities and media and the main players of their own local makers ecosystems. The launch was held at the European Parliament, in Brussels, and chaired by VicePresident Telicka and MEP Pirinski. 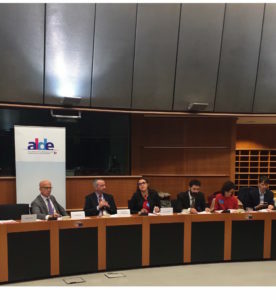 The aim of the event was to showcase how partnerships between makers and industry can develop cutting edge technical innovations with the potential to address societal challenges. 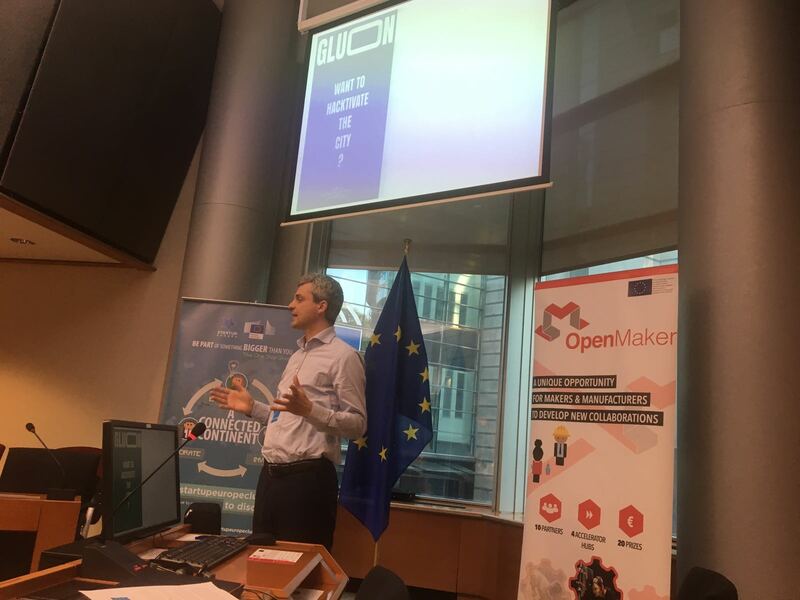 It addressed how the Maker movement, an emerging and dynamic social technology-based movement embracing ‘Open Manufacturing’, can become a new paradigm for production, closer to people and local communities. 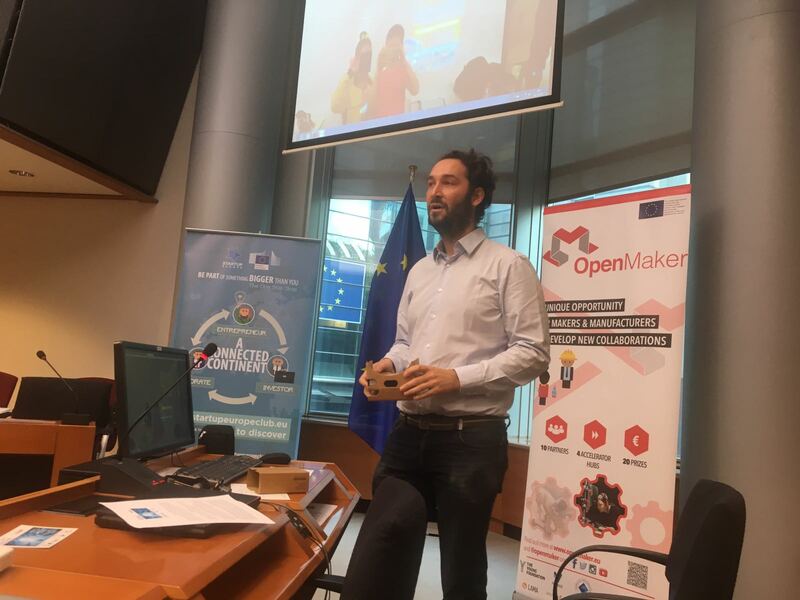 During the event a group of innovators and visionaries presented their stories, inspiring how makers and manufacturers can collaborate to create the industry of the future. 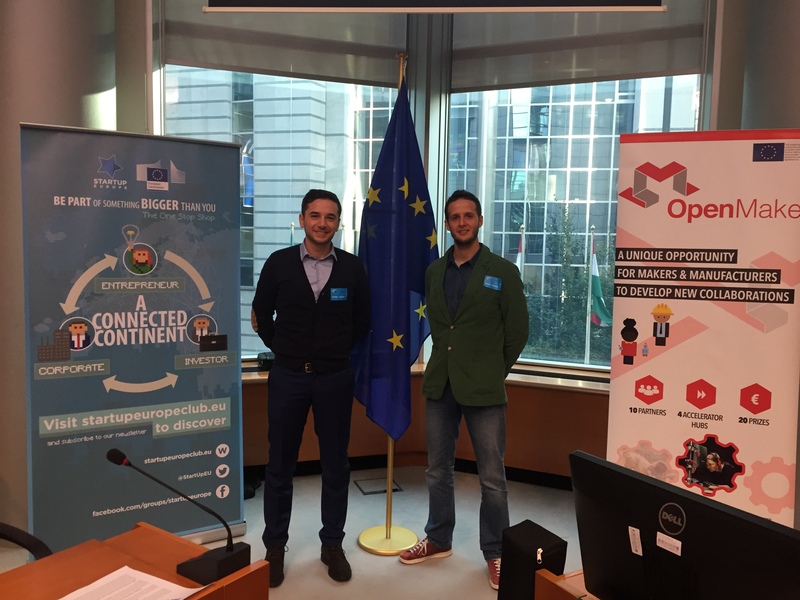 Francesco Pezzuoli and Dario Corona , from LiMiX, presented Talking Hands, the device that translates sign language into voice. LIMIX Srl is a spin-off of the Camerino University, founded in March 2015 from the department of Mathematics and Applications. LIMIX works in technological research, with attention to Gesture Recognition. The flagship product is Talking Hands, a wearable device that enables the translation of the sign language into voice, thanks to a system of sensors connected to a Bluetooth. BluRhapsody is a spin-off project of Barilla, developed to explore food 3D printing for pasta. Currently in its startup process, is serving Michelin’s starred chefs and high-level caterings to augment the gastronomical experience making it available for customisation of ingredients and shapes. 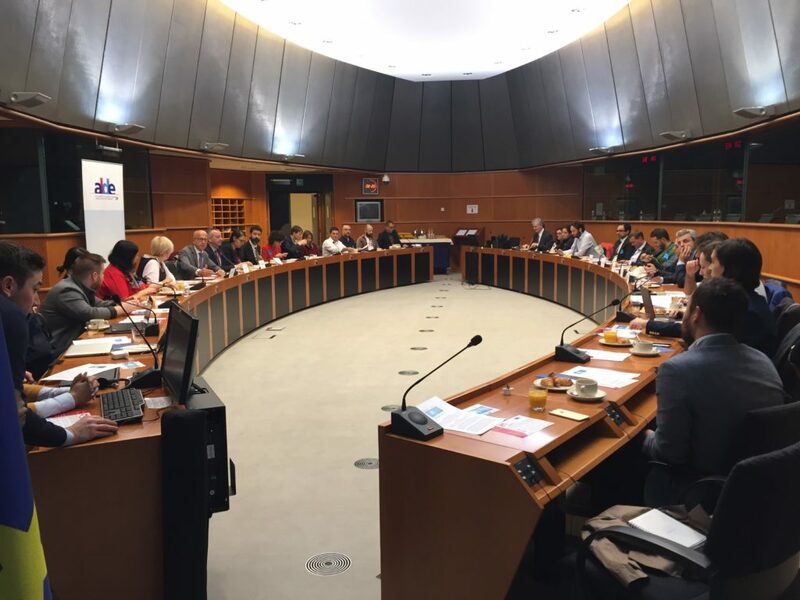 The project will also have a revolutionary impact for those with intolerances or that need to follow a specific diet. 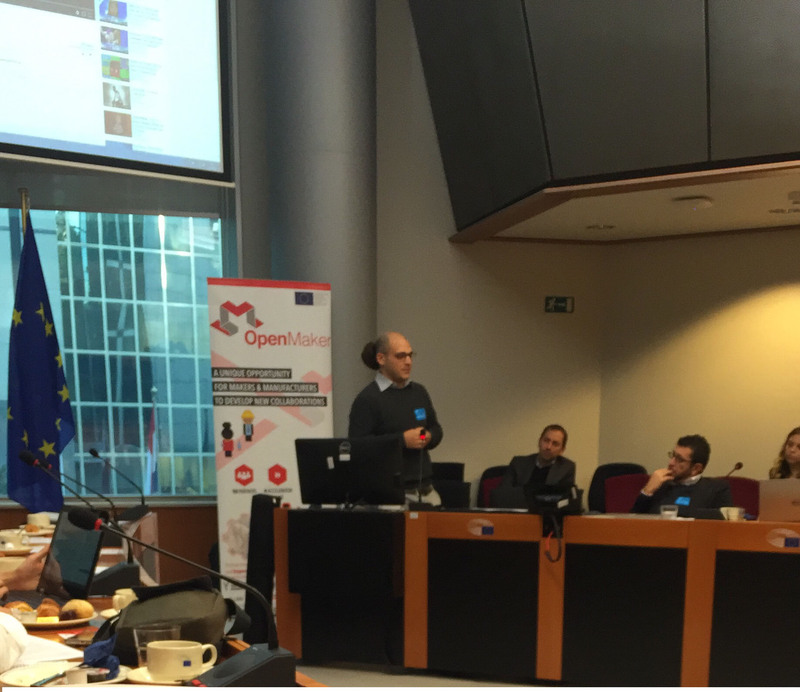 Fabien Benetou presented Opening virtual reality to the web, a tool to learn and discover. The open web brings new opportunity and challenges. Bringing virtual and augmented reality to the web means one can instantly share immersive content via a simple link. This seemingly simple action is opening tremendous possibility for collaboration not only to share content but also to make content. Virtual Reality (VR) and Augmented Reality then become tools to learn about the world around us and efficiently play with information, for work, art and just for the fun of it. The objective of the Opening Virtual Reality project is making VR and AR understandable and modifiable for all, from 3D professionals to kids. Generation Z is a project in which young people, artists and technologists set off on an interdisciplinary quest for solutions to big city challenges. 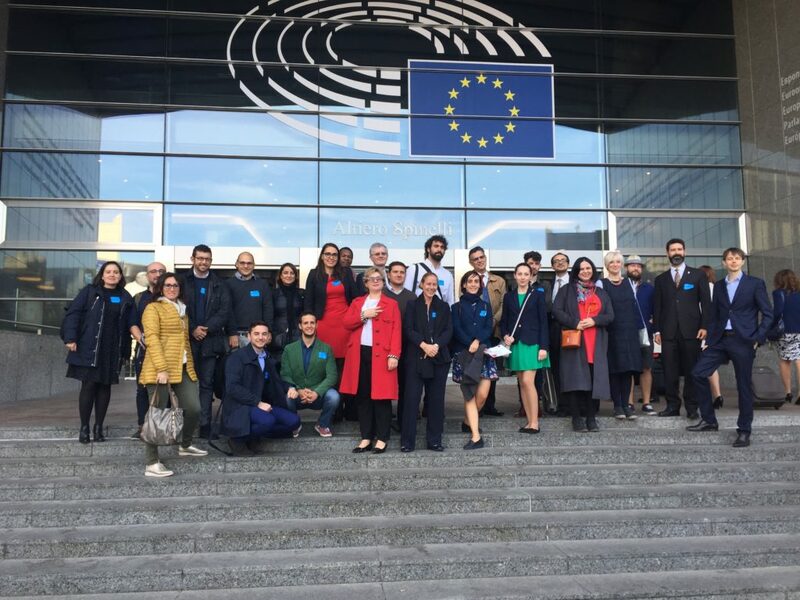 The young ‘urban activists’ draw their inspiration from the city and use new digital technologies to come up with ideas, tools and prototypes for a more sustainable Brussels. Gluon challenges (general, technical and visual arts) secondary school pupils (especially those coming from disadvantage background) to get thinking about mobility, ecology, health, energy and new media. Check out all pictures here!